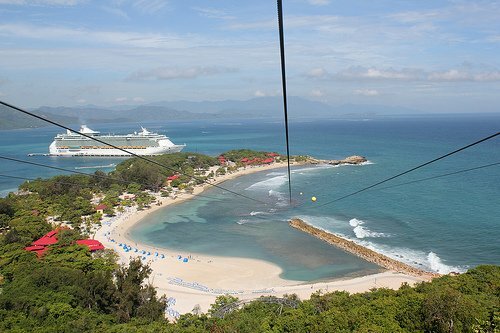 Perhaps no other shore excursion on Royal Caribbean's private destination of Labadee is as exciting and well-known as the Dragon's Breath Flight Line zip line. 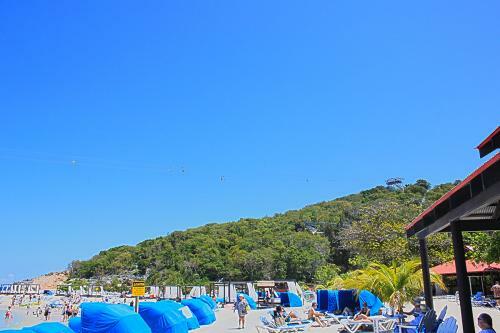 It has become synonymous with the island and offers guests the opportunity to soar through the air above Labadee at speeds of 40-50 mph. Dragon's Breath Flight Line will take you to a point 500 feet above the beaches of Labadee and then send you down a zip line that is longer than 2,600 feet. The zip line is visible from nearly everywhere on the island and it offers some incredible views. After checking in for the excursion, the staff will suit you up with the right harness for you and then present a short safety video to explain the basics of riding a zip line. Because zip lines are heavily reliant on staying safe, guests are escorted to a shorter "Little Dragon" flight line, where you can work on the basics with far less risk. While at the shorter zip line, the staff will demonstrate the basics of what to do and then allow you to try it out. It's a good primer of what to expect and it gives guests an opportunity to work on their technique. After that, you will board a truck and you will be on your way up the mountain to fly the real thing. The truck ride can be fairly bumpy, due to the road conditions. Once at the top of the mountain, the process is similar to the Little Dragon flight line and you are prepared to go and then sent on your way. From start to finish, the excursion will take around an hour to complete and the views you will get from the top of Labadee are unparalleled. There are views of the beaches, the coast of Haiti and your Royal Caribbean ship. Dragon's Breath Flight Line is open to guests at least 48 inches tall and cannot weigh more than 275 pounds. What I really enjoyed about Dragon's Breath Flight Line (and the reason I wanted to do it) was the amazing view you get while riding the zip line down. 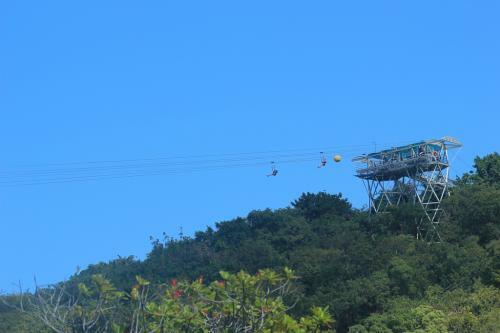 Royal Caribbean claims it is one of the longest zip lines in the world and your trip from the summit to base is almost a minute of air time. During my excursion, we had about 6 people decide to quit out of fear, which is something to consider if you have a fear of heights. How scary is it exactly? That answer depends on you and your fear of heights. The ride down is smooth and there is virtually little that you have to do during the ride other than maintain proper form. Royal Caribbean says you cannot bring anything that is not attached to your body, but in my experience I witnessed plenty of guests holding cameras and phones while riding. I would advise to invest in an accessory that allows you to attach your phone or camera to your body but understand you are risking losing that device if you do not. Perhaps the only real complaint I can levy against Dragon's Breath Flight Line is the price. As of the writing of this blog post, the cost of Dragon's Breath Flight Line is $95.75 per person (for adults and children). That is certainly not inexpensive. 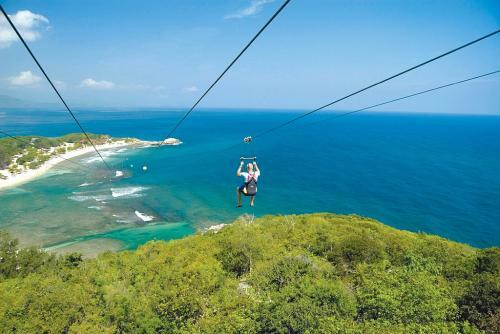 The reason why this zip line adventure is so popular and why so many guests elect to do it is because it's a very unique experience on Labadee and something that really stands out as exhilarating and memorable. I believe the Dragon's Breath Flight Line is worth trying, especially if you watch a few other guests go down it while you are on the beach and think it looks like fun. 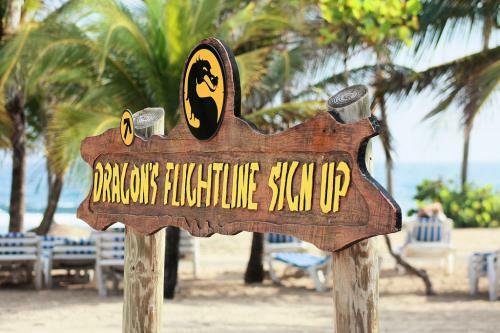 The Dragon's Breath Flight Line is a popular excursion, although there are flight times throughout the day. Reservations are recommended and can be made in advance on Royal Caribbean's web site, or at the Excursion Desk on board your ship. No, even though you go over the ocean, you do not make contact with the ocean at all.